"You're trying to set me up." Lionsgate has debuted the third and final trailer for the action-thriller train movie starring Liam Neeson, titled The Commuter. This trailer doesn't waste time setting up the story or the first conversation, it just gets right into it and shows some of the action. From the same director of Non-Stop (the airplane movie) and The Shallows, this is about solving a crime on the train. Neeson plays an insurance salesman who gets mixed up in a conspiracy on his daily train commute home. Vera Farmiga, a "mysterious stranger", sits with him for a chat and things get very interesting. The cast includes Patrick Wilson, Killian Scott, Jonathan Banks, Sam Neill, Elizabeth McGovern, Florence Pugh, and Damson Idris. I am still curious about this, but really not expecting much with this January release date. You can still see the first trailer + teaser poster for The Commuter here, or watch the second trailer here. In this action-packed thriller, Liam Neeson plays an insurance salesman, Michael, on his daily commute home, which quickly becomes anything but routine. After being contacted by a mysterious stranger (Vera Farmiga), Michael is forced to uncover the identity of a hidden passenger on his train before the last stop. As he works against the clock to solve the puzzle, he realizes a deadly plan is unfolding and is unwittingly caught up in a criminal conspiracy. One that carries life and death stakes for himself and his fellow passengers. 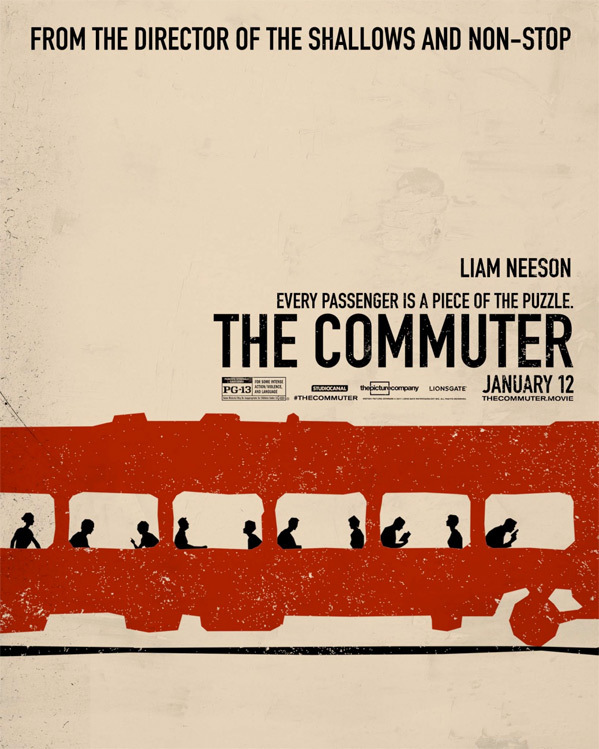 The Commuter is directed by veteran Spanish filmmaker Jaume Collet-Serra, of the films House of Wax, Goal II: Living the Dream, Orphan, Unknown, Non-Stop, and The Shallows previously. The screenplay is written by Byron Willinger and Philip de Blasi. Lionsgate will release Collet-Serra's The Commuter in theaters everywhere starting on January 12th, 2018 at the beginning of next year. Who's in?